It's been a while since I've hosted a guest author on Guiltless Reading. 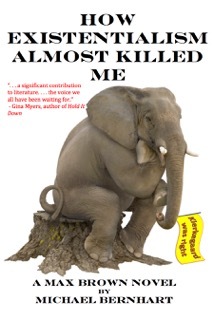 Michael Bernhart's novel How Existentialism Almost Killed Me had big appeal to me - an it's not just that elephant on the cover (sidenote: my old logo was an elephant). For one, this novel takes place in Cambodia which is a perfect complement to the Travel the World in Books reading challenge. Also, his brand of humour and the mix of so many different elements in his book made quite the impression: philosophy, chicklit and auras! 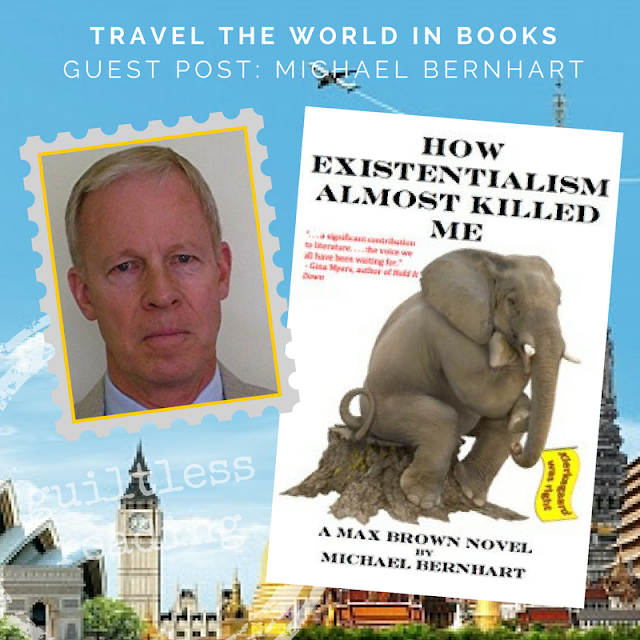 Let's welcome Michael Bernhart as he reveals why readers like us will definitely live another day over non-readers. Michael is also giving away two copies of his novel ... make sure not to miss the giveaway! That’s me. 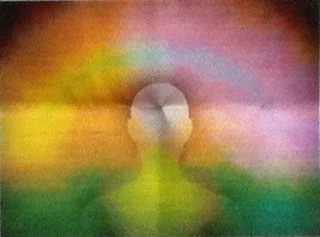 Some kind folks at a new age festival captured my aura on their aura-cam. They gushed that it was an exceedingly auspicious aura, and they looked sincere when they said it. In truth, I was having a good day. Young women returned my smiles; small children did not retreat behind their nannies at my approach; I’d scored two free massages; and my significant other had found – to that point – comparatively little to criticize. Maybe it was an auspicious aura. Not every day is a good day for authors; most days our auras can be printed in monochrome, gradations of grey. Look at the odds: One million new novels are published annually in the US alone – 2,700/day. Half of these are self-published, and the average number of sales falls shy of 250 books. It’s a losing proposition, financially and psychically. Why do we do it? Easy. We’re narcissists, shouting, “Look at me!” Those author photos, the subject oozing self-confidence and worldliness? Don’t be taken in. Of those 1,000,000 books, almost all are bad. The ‘quality filter’ that big publishers boast of still allows James Patterson on the shelves. Insane, right? In fairness to James, he reportedly has distanced himself from the production end of the operation. That dreck is the work of his minions. Self-published books have one advantage: thanks to permissive policies of CreateSpace, Nook, etc. an author can upload a revised/improved version daily and, through successive approximations, eventually grind out something readable. Assuming the author acts on constructive feedback. In contrast with the steadily improving indie book, the big publishers are stuck with the original, no matter how flawed, until the last remainders table has been cleared. Despite the odds, you should try to read; it’s good for you. If nothing else, Social Science and Medicine published a credible study (Yale School of Public Health) that found people who read a book for half an hour a day lived 23 months longer. 1. Blogs, such as this one, provide one filter. The downside is that many bloggers are reluctant to stick it to an aspiring author and either pull their punches or don’t post a review of a book they didn’t like. 2. Avoid debut novels. Usually overwritten, ambitious, and precious. Mine is. I’ve been struggling for months to turn it into something that a majority of readers who start will finish. 3. Prize winners? Something has gone wrong with the Pulitzer. 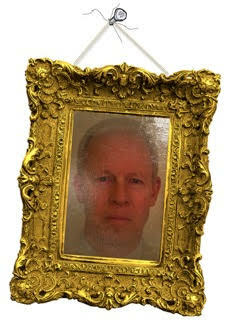 You should view a prize as fair warning that a few pretentious snobs in self-anointed centers of exceeding refinement have bestowed their grace upon a) an author most like themselves, or b) an author least like themselves (think third world, desperately poor, a gritty survivor). 4. Psychological thrillers. Avoid these too. I’m nominating this as the most promiscuously over-used genre of the decade. I studied psychology for a while (at Harvard! so you know it’s good stuff) and what authors dub as a psychological thriller is short on thrills and completely devoid of psychological insight. At best you’ll find a few groaningly lame stabs at the perp’s motives. 5. Authors who draw heavily on their profession are hit and miss. Yes, lawyers, doctors, and other professionals are not dependent on Wikipedia for context and problem, but Jonathon Kellerman has shown us that a PhD in pysch is not a guarantor of consistent quality or psychological insight. But read. If only one percent of this year’s outpouring is readable, that’s 10,000 good books to choose from. For openers, read the third and forth in my series. (Not the first and second; not yet. Still playing the successive approximations game.) Read the evergreens, the heavyweights, the classics. Hey! You just learned you’ve added two years to your life of quiet desperation; you have plenty of time to read. Get to it. Michael Bernhart is an award winning author who has published extensively on international development and public health – primarily service quality. His credentials for this written outpouring are a PhD (from MIT!) and four decades of international work – currently 50 countries and counting. The journey from writing funding proposals to writing pure fiction was short and easy. The result is the Max Brown tetralogy which traces the arc (from age 10 through 66) of a man who earnestly tries to avoid trouble, but whose own behavior – or events – repeatedly drops him into it. Each of the four novels finds Max struggling with a new existential crisis – or crises – as he grows up in these trying times. Manhood used to be a birthright; now it seems to be an unending series of challenges. Each novel also finds Max confronting a new face of evil. Dr. (why not use it?) Bernhart started this project before the internet could serve up virtual experiences to authors. The contextual information and situations come from service as a pilot in the USAF, living in Asia, Europe and Latin America, and inexplicable success at snaring women well out of his league. These remarkable similarities with the main character noted, he insists the work is not autobiographical. It’s wish fulfillment. Bernhart currently lives in a yurt on a mountaintop in northern Georgia with one ex-wife, two daughters, and three cats. He still flies his vintage plane, although more cautiously than before, and he’s unshakeable in his conviction that he’s God’s Gift to Aviation. About How Existentialism Almost Killed Me: Kierkegaard Was Right by Michael Bernhart*: This is the final novel in a series that examines the nature of evil. Remnants of the Khmers Rouges provide the face of evil, and they do a fine job. The plot revolves around drug counterfeiting, which was a daily challenge when the author ran a healthcare project in Cambodia. This by way of saying that the context and problem are faithfully rendered. The protagonists, Max and Sally Brown, are looking at middle-age, an empty nest, and wondering if their lives of ease and privilege add up to much. They are herded into a trivial assignment for the CIA which morphs into a dangerous job which pits them against the KR. Woefully inept, they leave a trail of corpses until they get up to speed. The battle is joined on elephant back, in a Thai brothel, in Cambodian minefields, and Khmer Rouge strongholds. The genre is nominally cozy thriller, with a brush with chick-lit, and philosophy.